A developer is planning to tear down this building to make way for a 21-story residential project that will include 21 below-market-rate units. MIDTOWN — A developer is planning to build nearly two dozen below-market-rate units in a new residential building on Madison Avenue, according to city officials. Developer Kahen Properties is seeking city approval to build a 21-story residential building at 143-145 Madison Ave. between East 31st and East 32nd streets, with 21 of the planned 71 units slotted for below-market-rate tenants, according to a spokeswoman for the Department of Housing Preservation and Development and permits filed with the city. 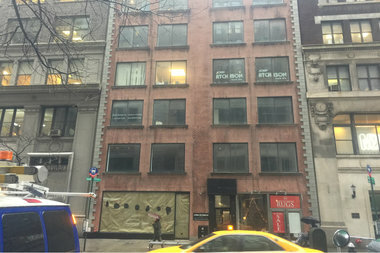 The Department of Buildings approved the demolition of the existing six-story building in July, which housed offices and ground-level retail, city records show. The building will include 2,779 square feet of ground-floor commercial space, according to the permit. Majid Kahen, a principal at the firm, filed permits with the DOB for the new building in May but the agency rejected the plans in August, according to DOB records, though the reason was not immediately clear. Kahen bought the property in 2013 for $12.25 million, records show. The below-market-rate units will fall under HPD’s inclusionary housing program, and the income bracket level for those eligible for the apartments will be decided once the project is financed, which is expected to happen in February, according to an HPD spokeswoman. Kahen declined to comment on his plans for the new building.